Often overlooked by British tourists, Belgium’s second city is well worth considering for a short break. Antwerp is the capital city of Flanders, the Dutch (or Flemish) speaking area of Belgium. Although inland, it is Europe’s second biggest port, but don’t let this put you off, the modern mechanised port is well away from the tourist area. It is easily reached by direct flights of about an hour from London City. Antwerp Deurne Airport is small and friendly, check-in time is only ten minutes! Brussels Zaventum is about 40 minutes’ drive away. If you’re driving, it is a toll free motorway journey from the Channel Tunnel taking about two hours in good traffic. If you prefer the train, today it will require a change in Brussels, (avoid the slow connecting train). Direct trains from London could be on the cards when the service to Amsterdam starts operating. Don’t worry about being understood; English is spoken everywhere, you can even keep in touch with Eastenders, as BBC television is available! The City Centre is quite compact, so no need of a car or taxi. If you do want to go further afield, there is an excellent tram network. If you arrive by train, you will arrive at the recently restored Central Station. A new through station has been tunnelled under the historic structure greatly improving the services available. The Cathedral of Our Lady, a UNESCO World Heritage site dominates the city. Started in the fourteenth century, it is reputedly, still unfinished. 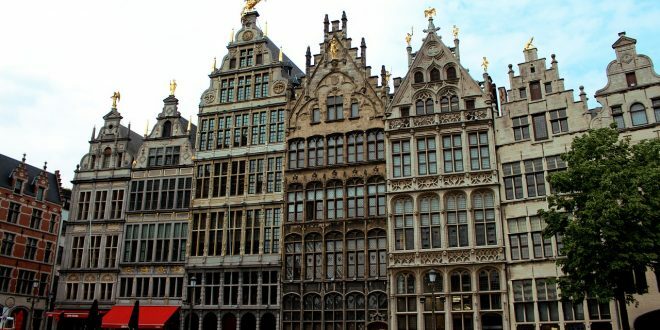 Surrounding the cathedral are various squares, of which the Grote Markt is the most famous with its classic Flemish architecture, plenty of bars, restaurants and opportunities to people watch. Antwerp Zoo close to the station is one of the oldest and most respected. The Rubenshuis museum and gallery is dedicated to the artist Sir Peter Paul Rubens who lived there. He is buried in Antwerp’s other famous church, St James. Other attractions include the Royal Museum of Fine Arts, the Plantin Museum (Printing), the Museum Vleeshuis (musical instruments) and the Botanical Gardens (Den Botaniek). The Antwerp diamond industry is world famous. Although hit by Asian competition there are still many artisans cutting some of the world’s most precious stones mainly found near the station. The main shopping areas offer a broad range, with a good number of specialist outlets particularly for fashion, for which the city is famous. Chocolate shops are everywhere in Belgium; Antwerp is no exception. All the leading hotels are present as well as some locally owned ones. Some are outside the city close to the ring road, so take care choosing if you want to access everything on foot. Food standards in restaurants are generally very good. Traditional French influenced dishes are giving way to the Modern European style. Seafood is popular. Belgium claims to be home (confusingly) of French Fries! They are served with most meals or as a snack from street sellers where they are accompanied with mayonnaise. Belgium beers are rightfully world famous, they produce both lager and ale types. Just outside the centre is The De Koninck brewery. It’s most famous beer is a dark delightful ale style beer of 5% strength. Ask for a Bolleke in any bar, strictly the name of the distinctive glass it is served in.